First off, this is most definitely a fantastic beer. The flavors tiptoe on the line between a black IPA and a porter. Such a characterization may, or may not, be justified, but that's what I've come to expect with any "Black IPA". And, if you're gonna call it an IPA it better be damn hoppy, right? I find this to be nicely hopped, and not in an oppressive manner. The roasted, nutty malts don't linger too long, which means you can get through the whole bottle without being reminded why you hate porters, for example. 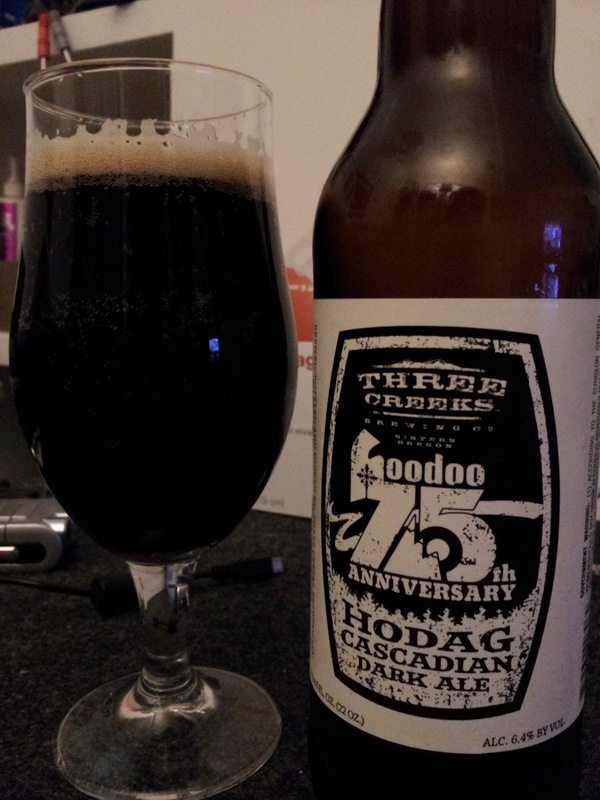 I was curious what the "Hoodoo 75th Anniversary" bit on the label is all about. Once I found out (it's a ski slope), I realized the necessity of this style: after a long day of skiing there's probably not much that can beat drinking an earthy, warming ale like this--especially high up in the Cascades. "Cascadian ales for the Cascades" I'd say. Cute. Finally, let's consider how this shapes up within the elusive Black IPA category. Who invented it, and who's best at making it? The former is probably unanswerable, but Hop in the Dark (HD) is still the answer to the latter--even after Hodag. Stone's Sublimely Self Righteous is not too far behind though. So I think I'll just stick with HD, mostly because I think it's better, but also because its the same price and I doubt I'll ever see Hodag around the San Diego bottle shops. But, still, cheers to Chris for another successful reconnaissance beer.